You’ll need 1 x 100 ARS card (£5.53) + 1 x 300 ARS card (£13.55) from MTCGame. £19.08 in total. 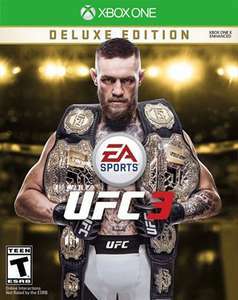 Go to the UFC 3 page on the Argentina store (follow link) and click the blue ‘Comprar’ (ie Buy) button and log in using your usual U.K. Gold account, this will first ask you to set up an account address for Argentina if you don’t already have one set up. Google is your friend. You can also use translate in Google Chrome, if you wish, however the process should be self explanatory for the most part as the store looks and functions like the UK store. It will then ask you to add a payment option, you need to select the redeem code option at this stage. Don’t bother trying Revolut, Starling or Monzo etc - those payment methods won’t work. The purchase has to be completed entirely using Argentina currency gift cards. This doesn’t need to be completed via a VPN and you don’t need to touch your console settings either. The game will then be available to download via your console as you normally would.